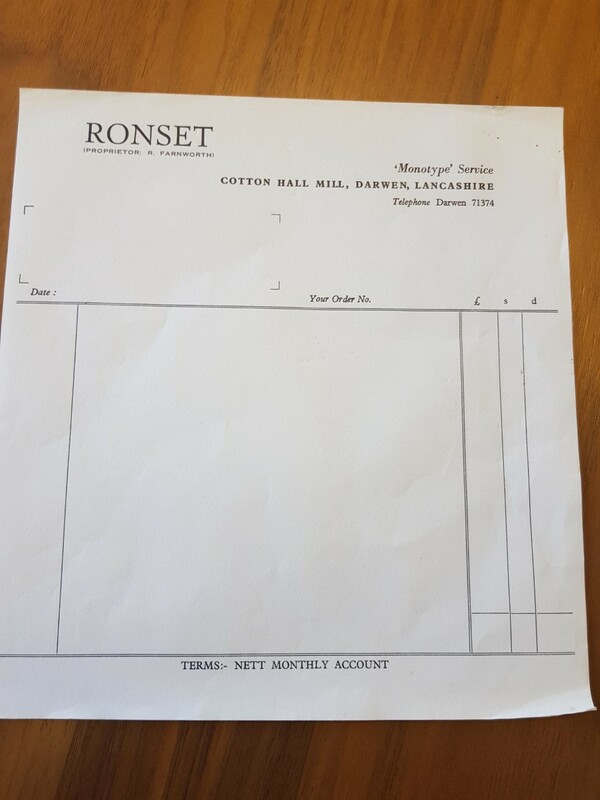 Our managing director Peter Farnworth received a blast from the past the other day when he received some old Ronset paperwork (seen here in the photos) which dates back to the 60`s from James Smith of Darwen who had a spell as an apprentice at Ronset back then. When he left the business he took a few pieces of paperwork as mementos, and when he was clearing out his attic the other day he came across them and thought he would pass them on to Peter. 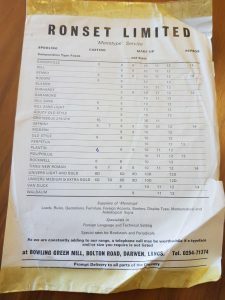 The paperwork is from the Monotype Hot Metal typesetting days, the sheet with the typefaces on used to be on the wall, they were the Monotype keyboard fonts (typefaces) that Ronset used to use back then. 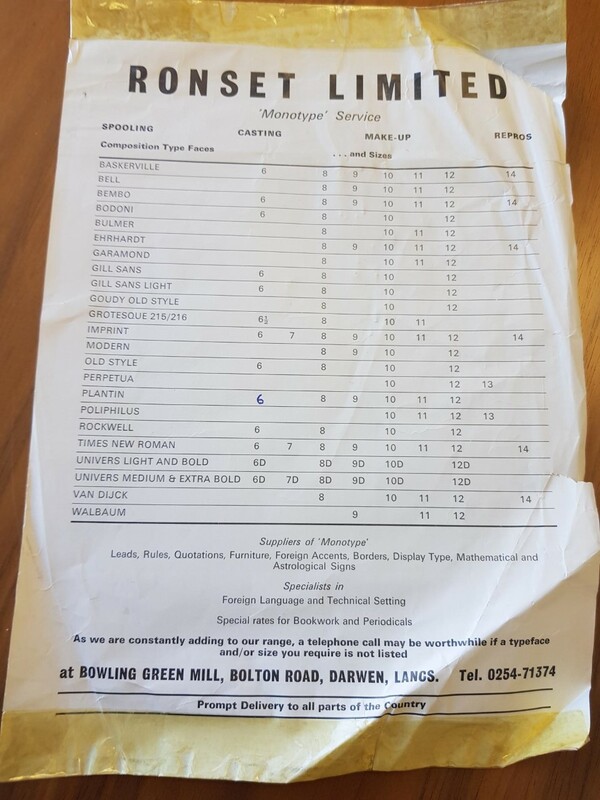 There were works instruction sheets, an old invoice, a label that the Monotype keyboard operator put around the perforated spool which used to drive the Monotype caster into moulding the type into a monotype cast. It is fascinating to see how printing has changed so radically over the years, those old methods seem very basic and rudimentary now but at the time they were the cutting edge printing techniques of the day. 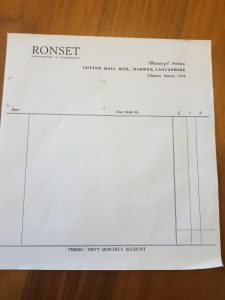 It also shows just how long Ronset Printers have existed as a business! 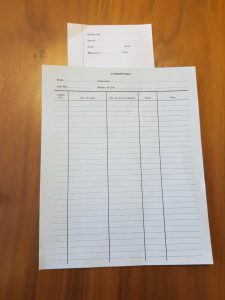 Not many companies, and especially printing companies, can boast of being around for 50 years plus, which just goes to show we are doing something right and (as Simon & Garfunkel sang back in the 60`s) “keeping the customers satisfied”. So if you want to use a printers that has an unrivaled knowledge of the business, vast experience, and that has stood the test of time, then Ronset are certainly the ones to get in touch with. If you have any queries over printing materials please give us a call at our offices here in Blackburn on 01254 297100.